Use SMS keywords to trigger unique responses, opt-in flows, and tag assignments. Send MMS messages and use media to drive audience engagement. With SMS Keywords, you can now look for and act on specific text in SMS messages that your users send you. Each keyword supports its own unique response and optional opt-in flow, so you can implement independent keywords for single opt-in, double opt-in, or no opt-in flows. You can use independent keywords and message flows to manage location information or channel attribution, or to simply text “win” to enter a contest without triggering an opt-in. Send relevant messages to users based on their keyword-indicated interests. Drive loyalty with unique keywords for loyalty members and non-members. Register new loyalty users directly through SMS. Intelligently automate messages based on keyword-tag combinations. 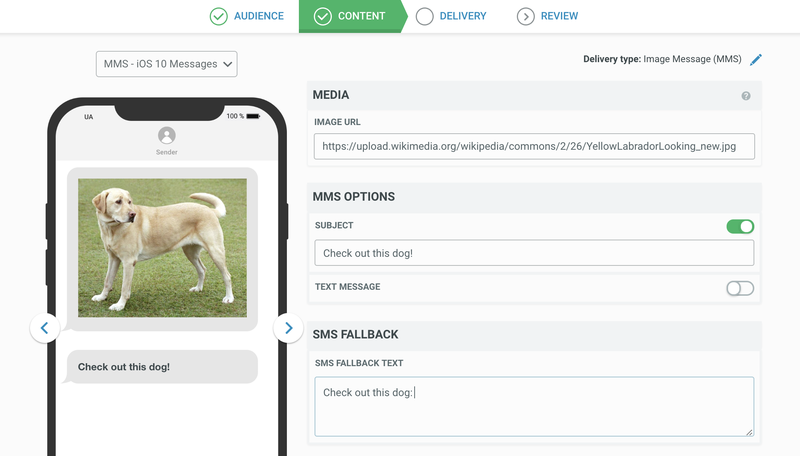 You can now send an MMS message to your SMS audience. Using rich media — such as images — can increase engagement and interest over standard text messages. This initial release supports images — jpeg, gif, and png. When creating a message, just select the MMS content option and provide the URL to your image. You can also include additional text or links to drive users to a conversion goal, and fallback text to support users who can't receive media. With MMS, you can match the rich-media content you provide through your apps, web, and and open channels, helping you unify your audience's experience across channels.